Recently, Drew Mills, founder of Mills Marketing & Communications, was asked about the importance of using personalities and icons in commercial advertising, and sports marketing. For over 20 years, Mills Marketing & Communications has been involved with GEICO’s Sports Personality and Icon Endorsements. These endorsements include The Gecko, The Caveman, and other GEICO icons. Sports marketing endorsements include celebrities from golf, tennis, pro hockey, The NFL, Major League Baseball, The NBA and much more. 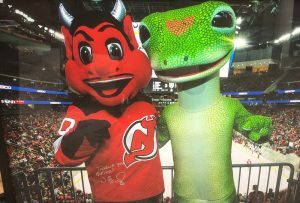 The GEICO Gecko with the New Jersey Devils mascot. Looking at the use of icons, Mills stated; “We are in a very competitive business environment and brands of all sizes are looking for ways to get noticed. Advertising icons and sports personality and celebrity endorsements are very useful in establishing and growing a brand. They can be very useful in establishing new brands that are not known to the general public. Today, the Gecko is one of the most valuable and well-known brand marketing icons. There are many other companies that have seen great success with icons. To name a few, M & M Mars has the M & M candy characters, Energizer has the Energizer Bunny, Michelin has the Michelin Man, and AFLAC has the AFLAC Duck. 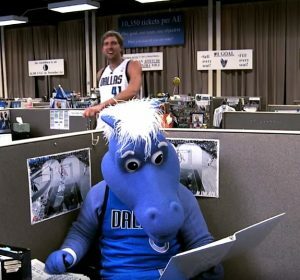 Dirk Nowitzki and the Dallas Mavericks mascot in the Hump Day TV commercial. There has been a huge increase in the use of both sports personalities and icons. Drew commented; “Over the last 25 to 30 years, the use of sports personalities and icons has dramatically increased. As a society, we’ve become more enamored with sports and celebrities, so it makes perfect sense that both are heavily used in sports marketing, in television campaigns, and advertising campaigns to promote products and services. It also makes sense because it works! Think about how prevalent personality endorsements have become. How many commercials do you see that feature Shaquille O’Neal? He does insurance commercials, back relief commercials, car commercials, and rental car commercials to name a few. He’s probably the epitome of using sports personality endorsements and their popularity to increase a brands awareness. Using sports celebrities for marketing, a once cottage industry has mushroomed into a huge business over the years! Where do you start with sports celebrity endorsements? When looking at how to use sports personality endorsements, there are certain things you need to do. While the use of sports personalities and advertising icon endorsements has grown in popularity over the years, it still is a niche market, and you need someone who knows what they are doing. With over 20 years of experience in this area, Mills Marketing & Communications can help reinforce your existing brand or new brand by uncovering celebrities and icons that are a good match for your company. We will help you with focus groups and research to select the right personality or icon. We will then help you build your brand and grow revenue by building a short and long-term marketing plan that will drive instant name recognition and long-term success. Have Questions? Call Us At (301) 208-9130 Or Click Here, We Can Make Help! Check out this GEICO TV commercial with Dirk Nowitzki of the Dallas Mavericks. He’s doing his version of the Geico Hump Day spot. We’ve had a lot of fun working with GEICO and our sports team partners over the years. Have Sports Marketing Questions? Click Here To Contact Us. Newsletter Sign Up. Keep Up To Date With Our Latest Activations! Click Here To Sign Up For Our Free Newsletter. Keep Up To Date With Our Latest Activations! To help organizations grow their revenue, improve their bottom line and build their brand through the use of Sports Marketing. We have a passion for helping clients create success through sports. Mills Marketing & Communications Inc.